I am so excited about my planned trip to the States that really I am fit to burst! Without giving too much away before I actually clarify dates, workshops, costs etc. and tie things down properly it looks as if I will definitely be in the Philadelphia, Michigan, San Fransisco, Loomis and Eugene areas and if any of you are in areas somewhere in between (or really anywhere else in fact!) please don’t hesitate to email me and we will see if we can set something up if you are interested!!! Thanks so much to everyone who has already been in contact and I will acknowledge you all fully here on the blog and publisize the workshops as soon as I get my head screwed on and we have events confirmed in our diaries. It is looking at this stage as if Alan and I will fly over for our holidays, I may do a workshop or two when he is with me and then after he flies home I will stay for another couple of weeks (or as long as it takes!!!) 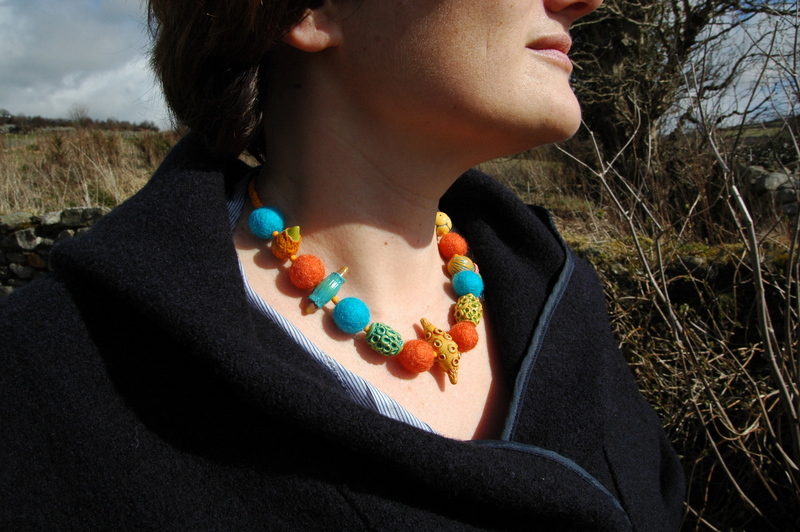 for some totally fabulous fibre fun! Apologies for my lack of posts over the last few days. The internet connection has been extremely sketchy, must be something to do with the fact that our weather has broken at last and amazingly for this time of year farmers (and the golf course) had actually been praying for rain! I have been working on fulling and shaping the sculpture that I started at the end of last week. This first experiment in creating a tall column shape should give a good indication of whether I need to make my felt thicker, use a different resist, have a larger space to work in etc., all the nitty gritty things that will help me when planning and executing pieces larger than my own actual height and width! When I started fulling and shaping I initially worked the felt around a long piece of electricity cable housing. I had intended on having this diameter as the finished width but discovered that the felt needed to shrink further to become stronger and self supporting so I put the work aside to see what on earth I could find to hand with a slightly narrower diameter to enable me continue the shrinking process. I returned to the scuplture the following morning having discovered the perfect fencing stake lurking in my garage, no problems now working the felt around the wood and beating it with a wooden spoon to finish firming up the felt! Pictures to follow when the piece is totally finished. Yesterday I spent a fun morning with friend and artist Rosin Markham. Amongst other materials Rosin sometimes works with gorgeous undyed raw wool from a variety of different sheep breeds. She very generously gave me samples and locks from some wonderful looking kinds, hopefully I will be able to take pictures later today and you will see the crimp and texture which should translate wonderfully into some finished felted work. As Rosin had never worked three dimensionally before I showed her how I work around a resist and she laid out a simple round vessel in graduating shades of undyed Icelandic wool. Meanwhile I decided that this was a good morning to get started on an ocean inspired bag which I am making as part of the current ‘felted bag swap’ on Ravelry. I tried out a new shape which with a little tweaking will be perfect as a basis for exploring a new complex felt bag design, just need to add another flap or two but need to buy more laminate floor underlay first! Rosin’s vessel was looking very good by the time she had to leave and my bag is now sitting on top of a rad drying while I plan and execute the dreaded cord handle. You may remember I posted a good while ago about the necklace I made my sister Suzanne for her birthday. She and my mother came over for a coffee on Sunday morning and I snapped a shot of her wearing it for my records, note the fact that she didn’t want her face to be shown, false modesty in my opinion but it does make for a good photo! Started a new sculptural piece at last! Yesterday morning I was able at last to start work on the first of a series of tall felt sculptures. Although I need to tidy the studio up yet again (what’s new?) and get some paperwork out of the way it was very satisfying to actually get this project underway if somewhat daunting at first. This outdoor and indoor series of sculptures has been in the planning for a long while and I nearly evaded starting the process yesterday morning because when it came to the crunch I almost seemed lost about where to begin! Eventually I decided that as many attempts may be necessary before I get the ‘perfect’ piece just to quit procrastinating and get on with laying out the wool. For this first piece I am working in graduating shades of grey Icelandic wool starting with charcoal at the bottom and changing through to a very light grey at the top. Because of resist constraints (I need to buy another large roll!) lay out was not as big as I might have wished but although the piece has another couple of day’s work to go it has given me an idea about the various difficulties I may encounter once I scale up for the much bigger outdoor pieces. Ideally I don’t want to use any fabric stiffener with these sculptures as I would really like the tactile nature of the felt to shine through. Whether this is totally practical for the outdoor pieces or not I don’t know yet as the design is tall and narrow but we will just have to wait and see. Needing to sell some felt in order to spend time experimenting on this exhibition type work has brought me full circle to rivisit the pricing debate yet again! Pop on over to Clasheen Uncut to take up the cudgel and if you have any suggestions re. online sites to sell from please make sure to leave a comment. I have also posted there today about a new craft related social networking site that I discovered last night called My Craft Corner, one to watch in the future I think. 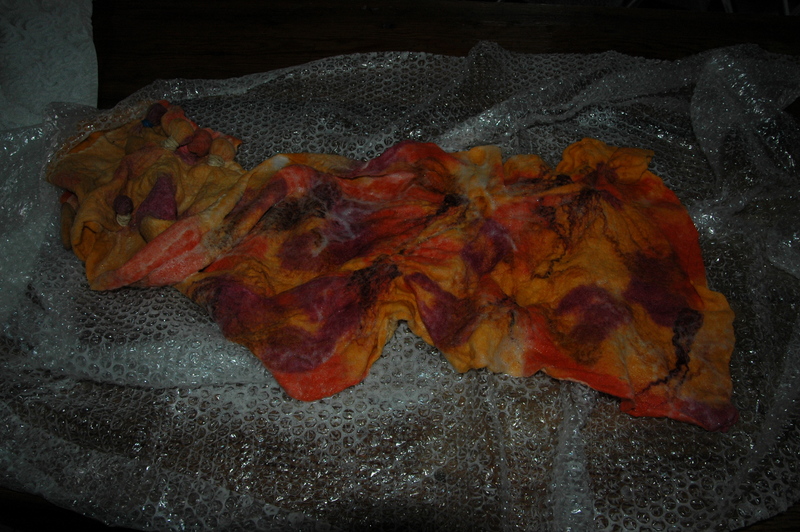 Some more shibori pictures and fabulous new wool arrives! 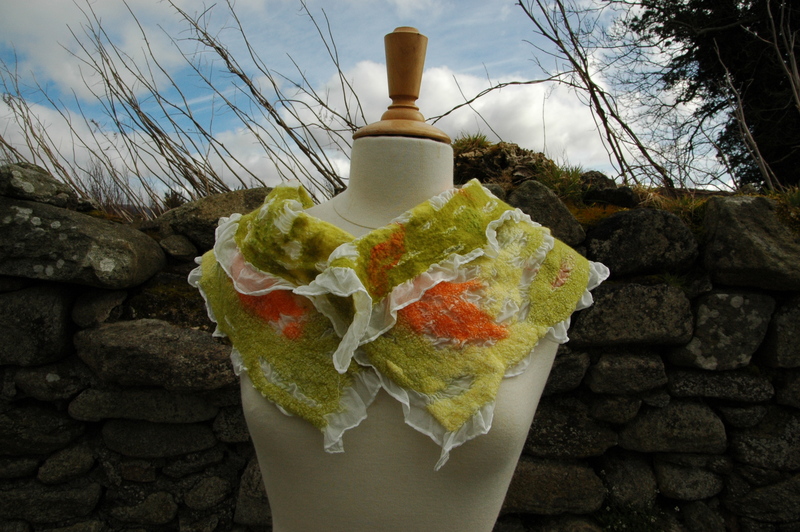 My second shibori experiment on St. Patrick’s Day was this simple cowl, again felted using merino, cotton gauze and silk. This time my design had a hole at one end through which the cords pull through from the opposite end to close the cowl, hope this makes sense! 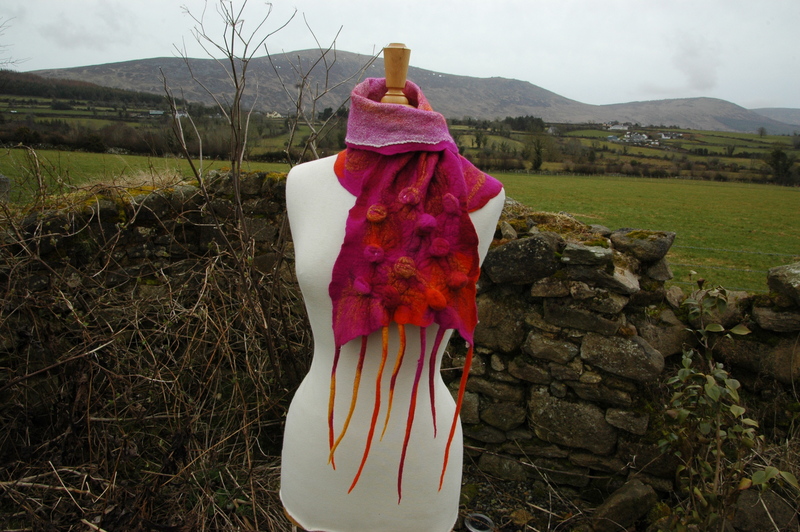 I love the combination of cerise, orange and raspberry wool as I think it gives the cowl a lovely warm and spicy feel. The cords were very easy to incorporate into the body of the felt and this is a design I am planning to play around with a little, possibly make my next cowl a little longer and a little narrower. Check out my Flickr photos for a full range of images from both sides of this piece. Yesterday morning my latest order of silk arrived from Wollknoll and boy am I EXCITED! When Lyda Rump was here for our workshops in February she was saying that they now were dying some fantastic wool similar to that which I usually get from Filzrausch, a short fibred19 micron merino. I asked Sonja Fritz is she would be able to include a kg of various colours with my order for silk and I was blown away by the subtlty of the shades and how beautifully soft and easy this ‘Kap’ wool is to work with. 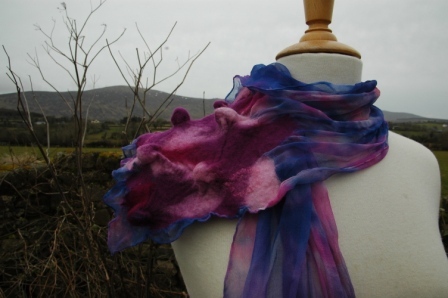 There was a PERFECT rose shade (I have never got anything quite as beautiful in this colour before) and it just cried out to be felted with one of Lyda’s gorgeous hand dyed silk chiffon scarves. Again I decided to experiment with a little shibori. My aim with this scarf was to emphasise the gorgeous colours from Lyda’s dying so I decided just to add wool at either end and not cover the chiffon completely. 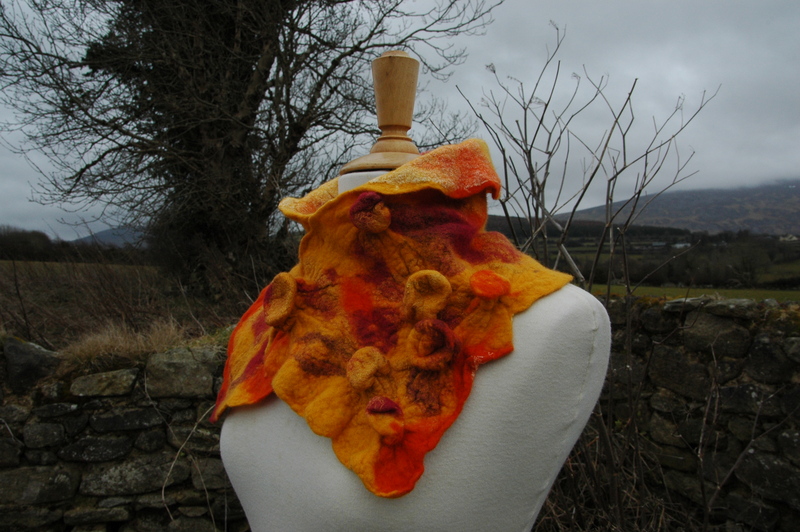 This created a fantastic and light scarf which would be an amazing present for someone allergic to wool, only the silk would be touching the skin when you throw the scarf around your neck! I have uploaded both these shibori pieces and my recent Zebra cobweb felt scarf to my Etsy shop this morning so if you are looking to treat yourself to a little uplifting pressie now is the moment! 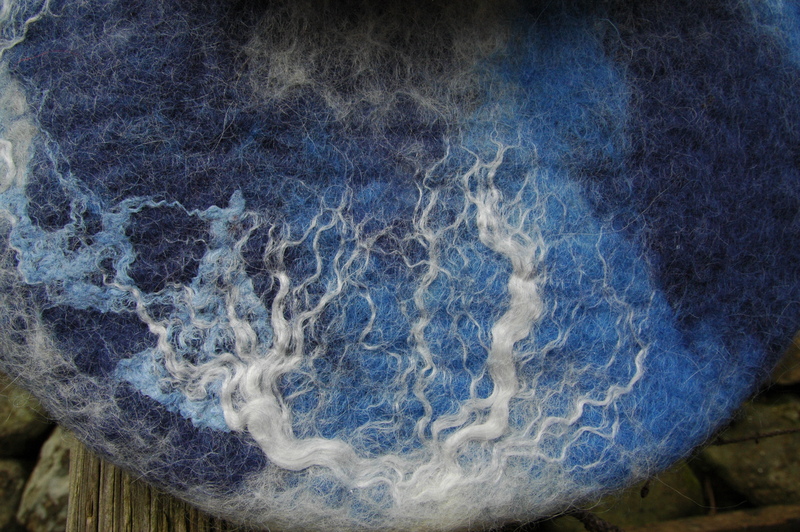 My felting experiments yesterday were fun, fun, fun. Amazingly I had decided to experiment with a shibori felt wrap/cowl affair only to discover when Carmen arrived that shibori was also what she had planned to do and neither of us had breathed a word of our intentions beforehand, incredible! Anyway, as part of the ‘Secret Swap Exchange’ I am participating in on Ravelry I needed to make a whimsical cowl for my swap buddy using yellow as the base colour. Thanks to some shibori tips from Chrissie Day I decided to tackle this project for some St. Patrick’s Day fun and here is what I have come up with! Using cotton gauze as a base I laid out a layer of short fibred merino which I then embellished with loads of gorgeous gold and maroon coloured mulberry silk. When the fibres were starting to penetrate the gauze fabric but before the piece was shrinking I tied glass nuggets into the felt securing them with rubber bands. I continued felting and fulling as usual and when the piece was totally shrunk undid the little bundles and pushed out the glass nuggets. Some of the resulting bubbles I left as was while others got pushed through to the other side to add contrast and interest to the surface detail. When I put the wrap on my manequin to take some photos it was interesting to see how reversable it actually is and to play around with the many ways it is possible to style it around the neck. Hopefully my swap buddy will like her new neck wrap and for more images and some detailed shots of the gauze side please check out my Flickr photos. If any of you want my fool proof receipe for English Sherry Triffle (with my secret Irish ingredient instead of sherry!) head on over to Clasheen Uncut where I am going to post it a little later in the day. Thanks to all of you who have either emailed me directly or left comments here and on Facebook wishing my sister Suzanne a speedy recovery, I will pass your messages on. Both she and my mother came to Clasheen late yesterday afternoon for our delayed Mother’s Day dinner, asparagus, free range chicken with all the trimmings and an Irish whiskey laced fruit triffle, a good time was had by all! This morning I am loafing around in my PJs and dressing gown, trying to catch up on all my internet mail and various other computer related tasks before heading over to welcome a new member to the Golf Club early this afternoon. I have two meetings tonight as well so please forgive me if you are waiting for a response to a query or an answer to an email, I am trying to get to everybody as quickly as I can but it is definitely a battle hard fought from a time perspective at the moment! Tomorrow is St. Patrick’s Day and as Alan will be away with his family and Carmen is also free we have planned a stress free and active day of fun, fibre and felting. I am going to try and have the studio and kitchen in some kind of order before I go to bed tonight making way for nothing but pleasure tomorrow, still not sure if I am going to continue with my series of cobweb scarves (thanks for the tips and comments), play around with some nuno experimenting or start on one of my planned sculptural pieces, will wait and see what the mood is in the morning. Thanks to Angela Barrow and Chrissie Day who both recently awarded me the Sunshine Blog Award and I hope that you both don’t mind that I am accepting them simultaneously probably breaking some unwritten blogging rule in the process. 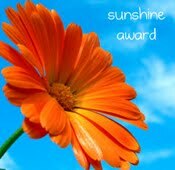 As far as I can understand it the sunshine award is awarded to bloggers whose positivity and creativity inspires others in the blog world so thanks a million to Angela and Chrissie, it’s lovely to think that my ramblings go some way towards brightening your day! The rules for accepting the sunshine award are (although you should feel free to ignore these rules and just enjoy the award!) put the logo on your blog or within your post, pass the award onto 12 bloggers, link the nominees within your post, let the nominees know they have received this award by commenting on their blog and share the love and link to the person from whom you received this award. Before nominating some inspirational blogs for you all to check out using the Sunshine Blog Award guidelines I would also like to say thanks to Nic from NicKnits who via the Tribal Talk banner on It’s a Hodgepodge Life nominated me as one of her blogs to check out! The blog that I would like to add to this fun group is That Artist Woman by Gail Bartel. 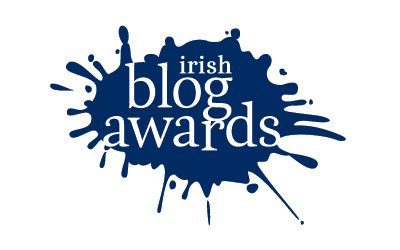 I have also discovered that I have made it to the long short lists for the Irish Blog Awards so thanks to the judges, sponsors, organisers and everyone who nominated me again this year, you all rock! Now for some of the inspirational blogs that I follow myself and by the way, please don’t be offended if your own blog isn’t here. Probably Angela, Chrissie or Nic linked through themselves or else I did myself somewhere in a recent post so I am not deliberately ignoring you, just trying to point you in a potentially new fibre direction (with the exception of Anna’s gardening blog) which I hope will light you your day today! In no particular order …..